AMETEK ROTRON® line of regenerative blowers are designed based on the regenerative principle. The impeller blades passing the inlet port of the blower draw air or other gasses into the blower. The impeller blades then, by centrifugal action, accelerate the air outward and forward. Here the “regenerative” principle takes effect as the air is turned back by the annular shaped housing to the base of the following blades where it is again hurled outward. Each “regeneration” imparts more pressure to the air. When the air reaches the stripper section at the outlet (the stripper is the part of the blower located between the inlet and the outlet in which the annulus is reduced in size to fit closely to the sides and tips of the impeller blades) the air is “stripped” from the impeller and diverted out of the blower. The pressures or vacuums generated by the one or two spinning, non-contacting, oil-free impellers are equal to those obtained by many larger multi-stage or positive displacement blowers. Regenerative blowers are available in many configurations designed to meet specific applications. AMETEK Technical & Industrial Products offers one of the largest selections of combustion blowers, and natural gas booster pumps. Our products cover the full range, from small Brushless DC radial blowers all the way up to large industrial regenerative blowers. You can count on AMETEK Technical & Industrial Products to meet your combustion blower needs. Applications for these systems include but not limited to residential and commercial furnaces and boilers, gas-fired food service equipment, water heaters, kilns and fuel cells. Nautilair Variable Speed blowers, the latest addition to our combustion blower offering, provide appliance and combustion engineers a key component to optimize their gas-fired systems. With the emphasis on greater combustion efficiency and need for lower NOx and CO emissions, the use of variable speed premix blowers offers design flexibility. Sealing Options on our Regenerative Blowers allow our blowers to handle the vast majority of hazardous duty applications and flammable gases. We offer two types of motor shaft seals, and an option for nitrogen purge. 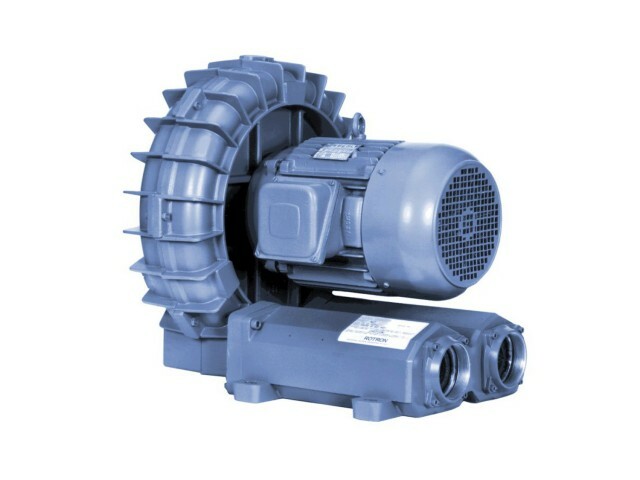 For closed systems we offer a line of magnetically coupled blowers. EN (Environmental Regenerative) series – featuring explosion-proof construction, heavy duty cast aluminum manifolds; spark resistant housings, covers, impellers, muffler towers, and manifolds; Teflon lip seal in a stainless steel case; and explosion-proof motors. EN_RD (Remote Drive Regenerative) series – featuring the same explosion-proof construction as the EN series with the added benefit of motorless operation. CP (Chemical Processing Regenerative) series– featuring EN explosion-proof designs with Chem-Toughâ„¢ corrosion resistant treatments, chemical duty motors, stainless steel hardware, and nickel plated flanges and muffler retainers. DR(Domestic Regenerative) series – featuring cast aluminum housings, impellers, and covers; cast iron flanges; TEFC or ODP motors; and permanently sealed motor bearings for a lifetime of 20,000-25,000 hours. DR_RD (Remote Drive Regenerative) series – featuring RD series construction, with the added benefit of motorless operation. NC (NautilairTM Centraxial) series – featuring fiberglass housings with polysulfate or aluminum impellers; models available for high flow/low pressure ventilation or cooling. MF (MultiflowTM/ WindjammerTM Variable Flow) series – featuring compact construction, built-in speed control, aluminum impellers and shroud, permanently sealed ball bearings for a lifetime of 20,000 hours; models available for AC or DC input. AMETEK Technical & Industrial Products offers one of the largest selections of blowers, fans,motors and pumps for heavy duty transportation applications and other commercial vehicles. This video will help you find the information necessary to know which blower you have and what you need.